We, at Absolute Opals and Gems Pty Ltd, (Australia) are second generation Gem-Stone Miners, Cutters and Wholesalers, proudly specialising in Australian Black Opal straight from the mines to us. You will find us located in the heart of the busy mining town of Lightning Ridge, New South Wales , approx. 750 km or 468 miles, north west of Sydney, Australia. Lightning Ridge, or ‘the Ridge’, as it is fondly referred to by locals, is renowned for the largest production of quality Black Opal in the World! The illusory mystique of ‘The Ridge’ has lured many a hopeful miner over the past 100 years to try their luck at finding the “big one”. While some lucky miners have fortuitously struck it rich, others continue the search resolute in there quest for that elusive prize: top quality “red on black”. Our display of a full and complete range of Lightning Ridge Black Opal in all its magnificent forms, a strong buying presence on the Opal Fields, an experienced and knowledgeable team and a genuine love of the entire range of opal and associated industry, makes Absolute Opals & Gems well worth a visit, especially if you too appreciate the wonders of Australia’s National Gem Stone… OPAL. SHOULD YOU DO VISIT THE RIDGE BE SURE TO VIEW OUR DISPLAY ROOM AT 66 MORILLA ST, LIGHTNING RIDGE, NSW 2834, AUSTRALIA. WE LOOK FORWARD TO MEETING YOU. We prospect for opal with a 9 inch auger drill. When promising material is discovered we drill a 3 foot diameter shaft to a depth that bottoms on the opal bearing level. When, what appears to be payable material is found, we lower a mechanical digger down the shaft. The dirt is extracted by a “blower” which, in reality, is more akin to a giant vacuum cleaner. When the truck is full, it is taken to an “agitator”- a modified cement mixer where the extracted dirt is washed for the duration of the weeks mining activity. Up to 10 truckloads of dirt go into each batch of wash, which accumulates and wears down to a much smaller concentrate by the end of the week. Then, we manually sort through the concentrated tailing and pick out the gems, often none, but once every few years hard work is rewarded by discovering a pocket of truly beautiful gems. Then it is off to the cutting and polishing room. We hope we can welcome you to our unique town one day! We can also meet you at the Tucson Gem show, Day’s Inn Gem Pavilion Absolute Opals Booth #3 and 4 every year late January early February as well. FOR ALL NEW OPAL CUSTOMERS, PLEASE READ THE FOLLOWING BEFORE BIDDING AND PURCHASING. “Positive Feedback” is important for the growth of all reputable opal sellers. We pride ourselves by doing our best to provide an excellent product and service to all our customers. If you are not satisfied with any aspect of your purchase, please message us so we can fix this problem and cancel the need for a negative feedback. Thank you. …..We take extra care with our packing to help ensure the safe arrival of your items. …..We strive to ship within 3 Post Office working days of cleared payment through PayPal. ….. eCheques take a minimum of 5 days to clear. ….. The amount of time spent in transit within the postal system is outside of our control. Normally “the stone appears larger in the photo than in reality” This is because a 10mm stone will show in the item listing photo as a 100mm stone on an average size laptop screen. Please check in the “item specifics” section for the actual dimensions of all listed items. The human eye sees objects slightly differently to that of the digital camera because of the different mechanisms involved with how they register light. Each person’s eyes see a little differently to the next persons eyes. The opal colours and patterns as seen in actuality are a result of a complex combination of refraction, diffraction, diffusion and reflection of light from the opal structure. 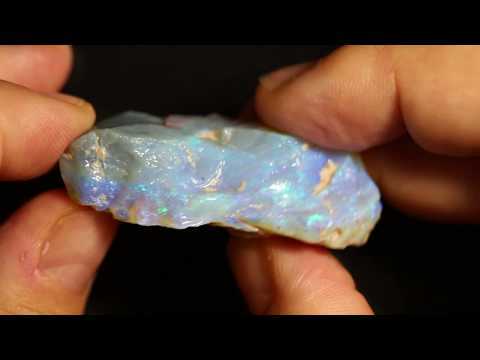 When an opal is viewed with different light sources and different light intensities the effect of the stone can change a little from one light source to the other. The total aggregated combination of these facts means there will be some degree of inaccuracy when representing opal with digital photography. To compensate for these factors I like to list our products by including still photos and a movie with all care and techniques applied to represent the item as accurately as possible. WE WILL PACK AND SHIP WITHIN 3 BUSINESS DAYS AFTER TOTAL PAYMENT IS RECEIVED AND CLEARED. INTERNATIONAL DESTINATIONS FROM 14 TO 21 BUSINESS DAYS. PLEASE KEEP IN MIND THE OCCASIONAL POSSIBILITY THAT CUSTOMS/BORDER PROTECTION CAN HOLD GOODS FOR UNDISCLOSED PERIODS OF TIME FOR INSPECTIONS AND PROCESSING. WE ARE HAPPY TO COMBINE POST TO SAVE TIME AND MONEY. TO DO SO PLEASE CLICK “REQUEST TOTAL FROM SELLER” WHEN READY TO PAY AND WE WILL COMBINE ALL YOUR WON ITEMS FOR THE COST OF ONE SHIPPING AND PACKING FEE. WE PURCHASE PACKAGING MATERIALS WHOLESALE TO SAVE MONEY AND PASS ON THIS SAVING TO CUSTOMERS BUT, WE DON’T BELIEVE IN SKIMPING ON PACKING SO TO HELP ENSURE THE SAFE ARRIVAL OF GOODS IN PRISTINE CONDITION. OUR POSTAGE AND PACKING CHARGES ARE OFFERED FREE WITH AUSTRALIA POST AS INTERNATIONAL OR DOMESTIC STANDARD POST. UPGRADES TO SHIPPING ARE AVAILABLE AT CLIENT REQUEST AT COST PRICES. THESE AT COST PRICES ARE CALCULATED AT AVERAGE COST WITH INFORMATION DIRECTLY FROM AUSTRALIA POST. TO OFFER THE BEST AND FAIREST PRICE, WE CHARGE THE AVERAGE, SOMETIMES WINNING A LITTLE AND SOMETIMES LOSING A LITTLE. PRICES ALSO VARY DEPENDING ON DESTINATION AND TYPE OF SHIPPING. PLEASE CHECK EACH LISTING IN THE “POSTAGE AND PAYMENT” SECTION, CLICK “CHANGE COUNTRY” AND SELECT YOUR DESTINATION FOR DETAILS. Please Note: Buyers are responsible for customs duties if required. Please check information for duties with your country’s customs prior to bidding or buying products. IF YOU DESIRE A DIFFERENT SHIPPING OPTION THAN THE ONE THAT IS OFFERED,(FOR EXAMPLE “REGISTERED” INSTEAD OF “STANDARD”) PLEASE MESSAGE THIS REQUEST TO US BEFORE PAYING AND WE CAN MAKE THESE CHANGES, ( WITH THE SAME CALCULATION AS OUTLINED ABOVE), TO YOUR INVOICE. All items listed for sale remain the property of Absolute Opals and Gems Pty Ltd, until full and final payment has been received and cleared by the relevant banking institute and we are satisfied that the transaction is not fraudulent. Absolute Opals and Gems Pty Ltd will not be held liable for any direct, indirect, special, incidental, consequential or other damages resulting from any product purchased from Absolute Opals and Gems Pty Ltd beyond the value of the product purchased, including, without limitation, any lost profits, business interruption of loss of programs or information. We strive to comply with our obligations in accordance with the Privacy Act 1988 (Commonwealth). We shall ensure that any of your personal information collected is only used for the purposes of order processing and providing you with requested or obligatory information. If you are not satisfied with your item please return it in its’ original condition within 30 days of receiving it. When the returned goods have been received by us and deemed to be original condition, we will issue you a 100% item refund, not including any import/ export duties that may have been incurred.